Komets 0 shots through the first six minutes. Once again an icing that should not have been called. When a defenseman cuts to the center of the ice instead of going after the puck in a straight direction, that negates the icing! Ridiculous. Pat Nagle made three saves and nobody cleared the puck as Luciani scores again. 4-3 Walleye. Ks penalty for too many men. Komets coach Gary Graham spent the entire time out period before that barking at referee Pierre Lambert. Don't know if Walleye are faster than Komets, but they are every bit as fast. 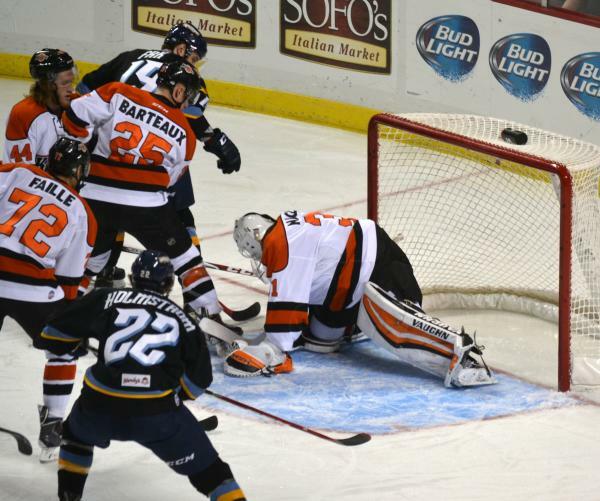 Komets need to use their bigger bodies a lot more than they have been. They've been doing OK getting in front of Lerg, but they need to do more. Embach stoned on a breakaway with 5:51 left in the period. Walleye still up 4-3. Ks going on the PP after Petryk takes an elbow to the chops.